that distills all the key metrics into a quick & easy to read Overview report. The Overview report provides an at-a-glance view of essential information for measuring your site’s page loading metrics: Avg. Page Load Time by Browser, Country/Territory, and Page. Plus you can compare your site’s average performance over time to forecast trends and view historical performance. All of these tools can help you identify where your pages may be underperforming and adjust so more visitors land on your site instead of waiting in frustration or leaving. 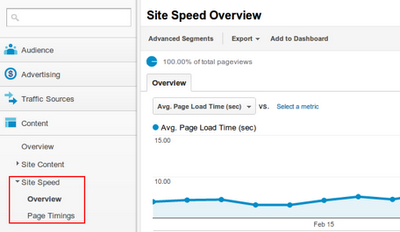 Previously there was only one Site Speed report, this has been renamed to “Page Timings”. 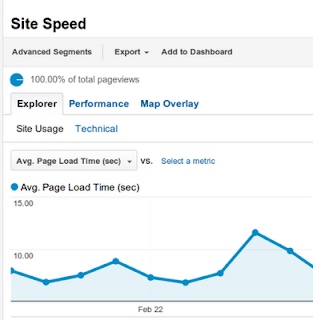 On the Page Timings report, you can view your site's load times in three ways: use the Explorer tab to explore average load time across dimensions, use the Performance tab to see how the load times break down by speed ranges, or use the Map Overlay tab to see how the load times breakdown by geography. The technical metrics included in the Page Timings report were launched a couple of months ago. So we’ve been working hard at making these metrics available in more of your favorite Analytics features. We’ve updated the Intelligence Reports to include the average site load times and all the Page Timings metrics. 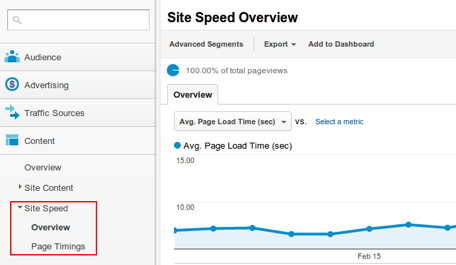 Now you can create custom alerts based on site speed metrics such as Avg. Page Load Time, Avg. Server Response Time. 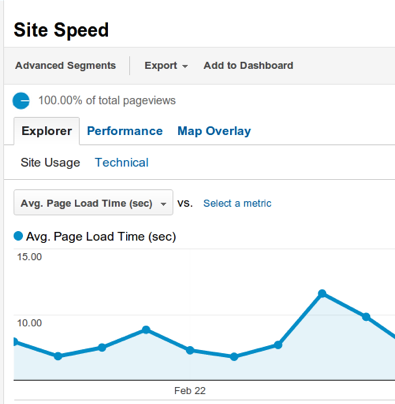 And view site speed metrics in the Analytics API and Custom Reports. Small sites (<10K visits per day) can now increase the site speed sample rate up to 100% to get full samples for page load time. Note that the processing limit of up to 10K per day or 1% of pageview hits (whichever is greater) still applies. In our continued effort to improve your experience of Google Analytics, we are excited to release an updated Site Speed report that distills all the key metrics into a quick & easy to read Overview report.